The story of birth of the St. Helens Striders in 1984 embodies the Strider spirit that prevails in the club today. The club may have around 200 members now, which is a far cry from the club that started in 1984 but the values of achievement and enjoyment in running remain strongly embedded. St Helens Striders is a running club that encourages runners of all abilities to achieve their running goals and enjoy themselves along the way. We are very proud of our legacy and will continue to try and inspire others the way our founders inspired us. 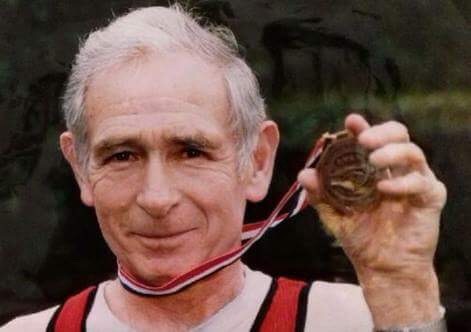 Born 23rd August 1929 Jim Crehan after retiring from Bold Colliery at the age of 50 and seeing the success and enjoyment his son and daughter-in-law, Jim (a top county runner) and Susan (1988 GB Olympian in the Marathon) got from athletics, decided to take up running and set his sights on conquering the marathon. Here he decided to found St Helens Striders in 1984, as a running and drinking club for his fellow ex-miners to keep them busy as the local mines began to be shut down, providing them all with the pleasure of running, competition and of course a good pint at the local pub that always ensued a long run. Jim would lead groups out on planned 10-mile training runs from the old club headquarters, only for him to get them all lost and have everyone running 15 to 20 miles, through muddy fields and in pouring rain, instead. Known as Mr Strider by his fellow club mates, Jim a non-driver, could often be seen running from St. Helens back to Parr with the shopping, or running off down the pub for a drink with his mates, a real-life Alf Tupper: Tough of the Track. Before long having competed in numerous marathons, Jim sought out a new challenge and after being down at the old track at Ruskin Drive, Jim asked if he could have a go at the long jump. Before long he added to his field disciplines with the triple jump and high jump. Adding to his ‘Tough of the Track’ persona Jim could often be spotted jogging out to the new Bold Forest Park, from his home in Parr, with bricks in either hand and his trusted Border Collie, Judi by his side, as he went to practice his long and triple jumps on the Sandy paths of the former colliery. He would use one brick as a marker for the long jump board and another to mark his distance. Jim’s training methods though bizarre put him in great shape as he went on to break British records across his three disciplines, in the over 60, 65, 70 and 75 age groups. And on his 80th Birthday Jim, at the Northern Veteran Championships held in Accrington added to those records, and his triple jump performance of 6.97m also put him 3rd on the world all-time list in the over 80 age group. But it was not just his performances that hold fond memories for his old teammates but his personality. Jim was filled with Irish charm from his family’s routes in Galway, and was always happy to help any fellow Strider member out, lending what cash he had to help teammates get to race or being a sounding board when someone needed to talk. Jim instilled the qualities that every Strider member still holds today that of friendship, fun and the spirit of great competition.